We now have Alfredo sauce for pizzas! fresh mushrooms, pepperoni, ham, red onions, green peppers, tomatoes, pineapple & Papa Dave's three cheese blend. fresh mushrooms, feta cheese, red onions, tomatoes, green peppers, black olives & Papa Dave's three cheese blend. fresh mushrooms, fresh cocktail shrimp, red onions, green peppers, tomatoes, pineapple & Papa Dave's three cheese blend. fresh mushrooms, boneless breast of chicken, red onions, green peppers, tomatoes & Papa Dave's three cheese blend. fresh mushrooms, Capicollo, jalapeno, red onions, Italian Sausage & Papa Dave's three cheese blend. fresh mushrooms, pepperoni, ham & Papa Dave's three cheese blend. ham, pineapple & banana peppers & Papa Dave's three cheese blend. ham, pineapple & Papa Dave's three cheese blend. fresh mushrooms, pepperoni, green peppers & Papa Dave's three cheese blend. fresh mushrooms, pepperoni, Italian sausage & Papa Dave's three cheese blend. fresh mushrooms, pepperoni, red onions & Papa Dave's three cheese blend. your choice of 3 toppings & a double layer of Papa Dave's three cheese blend. A double portion of pepperoni plus a double layer of Papa Dave's three cheese blend. Fresh Mushrooms, lean beef, red onions, tomatoes, olives & Papa Dave's three cheese blend. 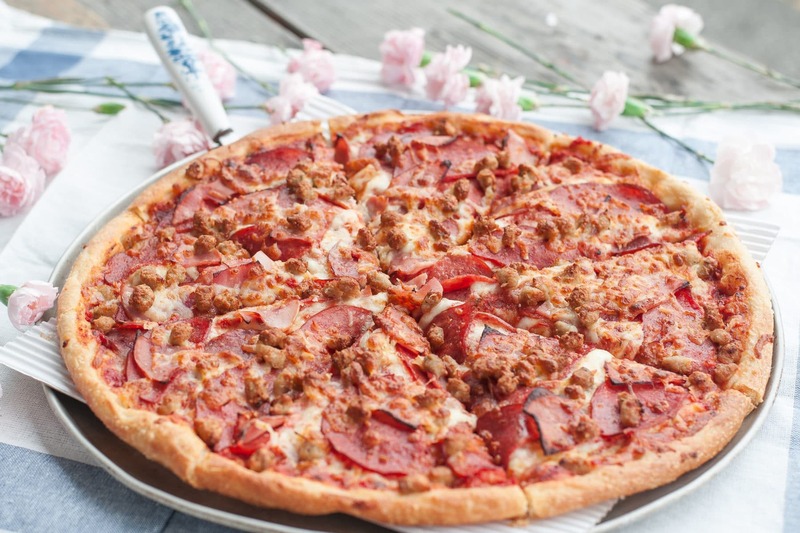 mild sausage, peppeorni, ham, real Italian sausage & loaded with Papa Dave's three cheese blend. Fresh mushrooms, red onions, green peppers, tomatoes, pineapple & Papa Dave's three cheese blend. Fresh spinach, tomatoes, feta cheese, olives & Papa Dave's three cheese blend. fresh mushrooms, red onions, tomatoes, black olives, banana peppers & Papa Dave's three cheese blend. We now carry dipping sauce for pizzas! All pasta orders served with Garlic Toast. All Alfredo pasta orders served with Garlic Toast. We add mushroom and tomatoes with pasta, if you don't need please let us know.